Written in 1928, ”Sweet Lorraine” found modest popularity with a recording by Rudy Vallee and his Heigh-Ho Yale Collegians. In that same year clarinetist Jimmie Noone’s Apex Club Orchestra made an instrumental recording of the song for the Vocalion label. Further recordings were made Isham Jones and His Orchestra (1932), and jazz violinist Joe Venuti (1933). It was Teddy Wilson and His Orchestra’s 1935 Brunswick recording, however, that made the pop charts for one week in October, rising to number seventeen. For Teddy Wilson it would be one of the first of dozens of hits he would produce in the 1935-1937 time frame. “Sweet Lorraine” was Clifford Burwell’s only hit composition. He worked as a pianist for several popular bands including Rudy Vallee and His Connecticut Yankees. Mitchell Parish is best known for penning the lyrics to “Star Dust” in 1929, but “Sweet Lorraine” was his first hit. The endurance of “Sweet Lorraine”as a favorite among jazz performers may be attributed, at least in part, to Nat “King” Cole, who kept the song in the limelight with his popular recordings. Cole’s fondness for “Sweet Lorraine” began as a Chicago teenager listening to clarinetist Jimmie Noone play. This was undoubtedly sometime after Noone’s group was called “Jimmie Noone’s Apex Club Orchestra,” as the Apex Club was raided and closed down for serving alcohol during prohibition in 1930. Nat was 13. “Sweet Lorraine” would play a memorable part in Cole’s transition from piano player to vocalist. The legend, which also reveals the source of his royal nickname, is told by Leslie Gourse in the liner notes for The Nat ‘King’ Cole Trio: The MacGregor Years, 1941-1945. Initially Cole’smain interest was piano, but in 1938, while performing in a Los Angeles nightclub, a tipsy customer asked him to sing, and Cole refused. This section suggests definitive or otherwise significant recordings that will help jazz students get acquainted with “Sweet Lorraine.” These recordings have been selected from the Jazz History and CD Recommendations sections. “Sweet Lorraine” is closely associated with Nat “King” Cole. Hearing Cole perform it with his trio (The Best of Nat King Cole Trio: The Vocal Classics, Vol. 1 (1942-1946)) gives one all the necessary information for being able to learn the tune. The improvisational possibilities within “Sweet Lorraine,” meanwhile, are explored most influentially on numerous recordings by Art Tatum, particularly those featuring his piano alone (20th Century Piano Genius). This melody is extremely motivic and uses the same pattern. The “A” motif consists of an ascending scale, followed by a skip of a downward third, from which the pattern repeats. In the “B” section (bridge), the motif is a simple scale moving up a fourth by step, then returning. This makes for a tune that “stays in the ear” and is easy to learn. Harmonically the “circle of fifths” is used extensively, bearing some resemblance to, among others, “Somebody Else Is Taking My Place,” “Charleston,” and “All of Me.” The I chord is followed by either a VI7 chord (“A” section) or a III7. In either case, the progression cycles back to the tonic key in a predictable fashion. This tune should pose few problems for the experienced performer. The novice will find familiarity with scale patterns and the circle of fifths to be useful. The period of the late 1930s and early ‘40s was a time of great interest in jazz. A number of indie record companies appeared, allowing their artists a freedom rarely granted by the big companies. In 1940, the Hot Record Society produced an album featuring New Orleans jazz veteran Sidney Bechet along with Chicago jazz stalwart Muggsy Spanier. The rhythm section consisted of ex-Ellington bassist Wellman Braud and guitarist Carmen Maestren (from Tommy Dorsey’s band), an unusual combination. The recordings came out in a 12” 78 rpm album, a novelty for jazz music at that time. Their version of “Sweet Lorraine” is memorable not so much for solo work but for the wonderful interplay between the instrumentalists, who created a beautiful, mellow ensemble sound rarely heard from a pickup group. This 2-CD set features two solo piano renditions of “Sweet Lorraine.”’ The tempo ranges from a relaxed medium swing on one version to a brighter tempo on the other, but both versions are irresistible and feature Tatum at his most swinging. Cole recorded “Sweet Lorraine”’ on multiple occasions and was perhaps the tune’s definitive vocal interpreter. This swinging trio version is one of his best. Grappelli takes “Sweet Lorraine”’ at a relaxed medium tempo and his irrepressible sense of swing proves to be a perfect fit for the tune. It is unusual to hear a female vocalist interpret this song, but Wilson does a fabulous job in this slow duo exploration with pianist Mulgrew Miller. ”Sweet Lorraine”’ succumbs to pianist Barron’s gentle touch, while bassist Ray Drummond and drummer Ben Riley give her a little nudge. Though this CD was issued under Lester Young’s name, Young is nowhere to be heard on this tune; this is one of four tunes on the album that instead features the tenor saxophone of a very young Dexter Gordon along with the trumpet of Harry “Sweets” Edison. The bandleader here is Nat “King” Cole; although Cole was known for his vocal renditions of “Sweet Lorraine,” he sticks to the piano here. The old guard meets the new guard with surprisingly touching results. 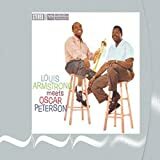 Vocalist Armstrong delivers a sincere “Sweet Lorraine”’ as Peterson’s quartet supports him with grace and depth.